If anyone has been reading this blog for long enough, they will soon realize my penchant for all things Franc, Viognier, and Pinot Noir. No, it is not an echo of Miles Raymond, and his penchant for Pinot in his own words; “It’s uh, it’s thin-skinned, temperamental, ripens early..”. Really, it is because it is rich and layered, but green and ethereal, while still packing a punch of black and red fruit. In other words, it is a complex wine which needs love and care and that is not easy to find in the kosher world. 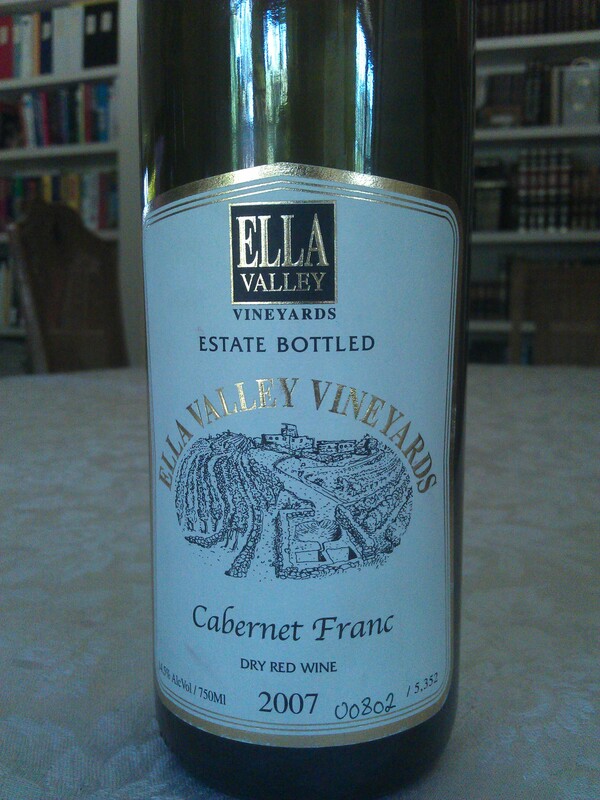 When we talk about who makes the best kosher Cabernet Franc, the names Four Gates and Ella Valley come up all the time. I tried the hagafen wine a few times, and sometimes it is nice and sometimes it is not, but the 2007 wine was showing best a year ago. The 2008 Prix Cabernet Franc, was pretty good at the winery, but we did not get to it this past weekend. The Gush Etzion was showing well, and the Psagot showed nicely as well. With that in mind I set out to taste many of the best current kosher Cabernet Franc wines and a few older ones to boot! In the end, the Four Gates and Ella Valley Cabernet Francs won, but there was a couple of honorable mentions as well. I MUST Stress, each and every one of the Cabernet Franc wines MUST be decanted or aired out at least 3 to 4 hours ahead of time! These wines are not weak and frail, but rather powerful in body and soul, and need time to show their true selves. The wine needs serious air to open, and shockingly has some oxidation that exists on the wine. We smelled the oxidation on wine we tasted at the winery and here as well – so, do not worry. Also, folks at the table thought the wine was tired and old, but that is just 2010, a very hard year to make happy. That said, the wine is nice and lasted a long time, so just air it out and you will be happy. The nose starts off with nice crushed herb, cranberry, oxidation, nice mint, along with a very almost menthol/eucalyptus note. The mouth on this medium bodied wine has lovely bracing acidity, plum, dark cherry, candied raspberry, sweet cedar, and tart fruit. The finish is long and herbal with nice green notes, coffee, and nice tobacco. Tart fruit, crazy herb, and leafy tobacco linger long. WOW! I just checked my notes from 2009, more than 4 years ago and sure enough this wine has changed little! Yes the wine is starting to show its age, but not with any flaws as much as showing leather and green attributes more than oxidation or real age. The wine is still tehre but is in drink NOW stages. The nose on this garnet colored wine is still far more earthy than fruity, still hopping with loamy dirt, raspberry, plum, and bell pepper. The mouth on this medium to full bodied starts with an attack of now nicely integrated tannins (that still pack a punch), but follows with a full mouth red fruit and hints of darker fruit as well, along with sweet cedar, mineral, and graphite. The finish is nice and long with spicy oak, tobacco, vanilla, cloves, along with more forest floor dirt, and red fruit. Drink NOW! Like the last time I had this wine, this one needed so much air it is CRAZY! The wine showed poorly in the evening because it did not have enough air at all, and that was after three passes through the Venturi. To me the venturi is great for some things, but waking wine from the deep sleep they sometimes are in – requires time and air! To me now, the wine was still not as good as the 2007 Four Gates Franc, but it was in the running behind the 2009 fCab Francs – which were all more appreciated for their broader tannin punch and the 2009 up front fruitiness. The nose on this black colored wine screams out at you from the second the wine hits the glass, with rich tar, tobacco, chocolate, cloves, crazy spicy oak, massive piles of crushed herb, lovely veggie patch with cucumber, asparagus, and mint. The mouth on this full bodied and super rich wine shows clear oak influence with slight restraint. The mouth is rich, concentrated, layered, and mouth coating with now integrating tannin, crazy black cherry, rich blackberry, integrated with nice red fruit, awesome acidity, and more spicy cedar. The finish is super long, spicy, and extracted with tobacco, chocolate, mounds of spice, cloves, black pepper, crushed herbs galore, and a clear sense of mineral and sea salt – BRAVO!!! This was my last bottle and if you have more this will last a few more years IMHO. Where the 2007 was earthy and showing tanned leather, this 2009 wine is going nowhere anytime soon and has layers of deep extraction! The 2007 has the best extraction and herb combination, but this is the second best right behind it. This wine is a blend of 85% Cabernet Franc and 15% Merlot and that 15% does add dark fruit to the wine. This wine as well needs tons of air, open a few hours – or better decant. The nose is rich and layered with clear green notes, crushed herb, heat (understandable for the 2009 harvest), hints of blueberry, dark cherry, and date, along with asparagus, and spicy oak. The mouth on this medium plus bodied wine is rich and layered with nice pencil shaving, rich mouth coating tannin, nice mineral, along with saline notes, blackberry, black plum, raspberry, and spicy oak. The finish is long with even more pencil shavings, coffee, massive rising tannins, dirt, licorice, slight orange pith, along with mounds of tobacco, smoke, vanilla. This wine is controversial – simply because it lacks any green or herbal notes, almost neutered in a way. The nose starts off with rich and ripe raspberry, along with strawberry, and oak. The mouth on this medium bodied wine is free of green notes, but does show nicely red fruit, candied currant, along with lovely mouth coating tannin, sweet cedar, and tobacco. The finish is long with rising tannin, nice structure, and dirt. The nose on this still dark purple wine is hopping with oak, cherry, raspberry, plum, blackcurrant, lovely herb, strawberry, floral notes, lovely leafy tobacco, green notes that come out after some time, and expressive baker’s chocolate. The mouth on this medium to full-bodied wine is highly structured, concentrated, and extracted with oak influence, that mingles nicely with mouth coating tannin and rich red fruit, into an expressive and surprising mouthfeel for a Cabernet Franc from Four Gates. It is showing its lovely acid and tart bright fruit, all wrapped in an enveloping rising tannins. The finish is long with nice chocolate, fruit, mounds of vanilla, oak, tobacco, spice, and light leather. This wine is showing well ONLY after many hours of open air, so please make sure to air this out in a decanter for two hours ahead of time. This wine is unique in the fact that a Cabernet Franc wine has blueberry notes on it! The wine is a crowd please and a full bodied wine, but still controlled which is not easy for the 2009 vintage. The nose starts off with a blueberry attack, along with sweet red and black fruit, herb, and green foliage. The mouth on this full bodied wine is richly extracted with good blue and black fruit, along with raspberry, blackberry, black plum, good spice, along with lovely mouth coating tannins, and sweet cedar. The finish is long and spicy with mounds of vanilla, licorice, black pepper, tobacco, and some nice dirt to bring it all together. Posted on August 16, 2013, in Food and drink, Israel, Israeli Wine, Kosher Red Wine, Kosher Wine, Wine, Wine Tasting and tagged Cabernet Franc, Ella Valley Winery, Four Gates Winery, Gush Etzion Winery, Hagafen Winery, Psagot Winery. Bookmark the permalink. 2 Comments.